Occasionally in life, we come across a road with no clue where it will lead to, or even that it exists, but, nevertheless, a force within leads us down its mysterious path for no apparent reason. Such was the case when I visited the local kennel to check-out its boarding facilities. As I walked by one of the cages, I noticed that the cat inside was rubbing his head against the wire mesh door and gently purring. I reached into the cage and began petting him. Instantly, love and affection oozed from this cat (so much for the myth of the aloofness of felines). I noticed a tag on his cage. It indicated that the cat’s name was Patches. 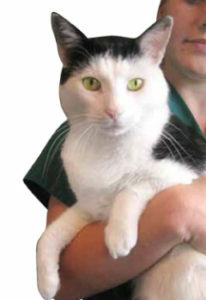 It also indicated that he was up for adoption. Puzzled that Patches was up for adoption, I asked the attendant what were the circumstances that brought this about. I learned that Patches was given to the shelter about six months earlier by someone who had lost her home through foreclosure. I also learned that Patches had Feline Leukemia Virus (“FeLV”), a deadly virus that can be transmitted between cats. I was surprised, since Patches showed no outward signs of being in ill health. Indeed, my observations were that his eyes were clear and bright, his coat was full and shiny, and he was perky and very playful. Amazingly, although heart-wounded and confused by finding himself homeless – – the victim of a housing crisis he cannot understand – – love still radiated from within Patches. I was deeply saddened to learn about the unfortunate predicament that Patches was in and, after I left the kennel, I could not get him off my mind. The disturbing thought kept coming back of such a beautiful animal condemned to live out his life in a cold, metal cage. Given the grossly disproportionate number of homeless cats to available homes, the prospects of an adult cat being adopted is not very promising. Consequently, Patches, who was estimated to be about five years old, already has one strike against him. Couple this with the diagnosis of FeLV made an already difficult situation virtually hopeless. The realization that oftentimes life is not always fair did little to ease my troubled thoughts of the sad plight of this loving animal with the seemingly indomitable spirit. The nagging question tugged at my side of how much longer could Patches continue to be confined, until his spirit would be broken and he would no longer rub his head and purr with each passerby, having given up hope of finding the home that he so desperately needed. Out of frustration, I began reading the literature on FeLV. The literature indicated there are two tests to determine if a cat is FeLV-positive. The most commonly used test is ELISA, which is typically performed in a veterinarian’s office. ELISA is quick and efficient, however, it can produce a false-positive. In contrast, the IFA test is done in a medical laboratory and its results are considered conclusive. Although it was a long shot, an IFA test presented a flickering hope for Patches. I contacted the vet in charge of the kennel and asked him to let Patches be given an IFA test on the off-chance that he had a false-positive. The vet agreed. A few days later, I received a phone call with the test results. Patches was negative! The obvious implications of the results for Patches meant a fighting chance to find a home. Beyond the implications for Patches, is the question of how many countless cats have been euthanized, or doomed to an existence in quarantine, and could have been spared by a simple confirmatory test. While Patches had overcome his biggest battle, he still faced an uphill struggle in his search for a home. After learning that Patches was negative, I contacted a local shelter (Feline Friends, Deerfield Beach), to make them aware of the potential benefits of a confirmatory test and mentioned to one of its directors (Beth) that the shelter where Patches was housed did not have a website that promoted adoptions. Beth graciously offered to post Patches on their website under “Adopt Us!” Unfortunately, neither the adoption posting, nor an article that I had written about Patches with a view towards finding a home for him, were of any avail. Despite now being confined to a cage for nearly nine months, Patches had not given up hope. This was manifested when Patches would continue to rub his head and purr with each visit to the kennel to reassure him that he was not forgotten. It was as though, if Patches could speak, he might say: “Please, save me, so I can live the rest of my life as a happy cat with someone to love” (He might add, “A room with a window that I could peer from would be a plus!”). The question remained was there someone, somewhere – – an angel – – who would open their heart and give Patches the ultimate gesture of kindness, a loving home. Hopefully, Patches’ indomitable spirit, where hope springs eternal that he will find that loving home, would connect him to that angel. Then, one day I went to visit Feline Friends and a volunteer (Joyce) arrived and mentioned to Beth that she knew of someone who would be visiting Feline Friends with a view towards adopting a cat. Beth responded that I knew a cat named Patches that was in need of a home. This selfless gesture was particularly remarkable, as Feline Friends had dozens of cats that they painstakingly care for, which were also in desperate need of a home. When I indicated to Joyce that I had written an article about Patches, she agreed to send it to this lady. A few weeks later, I learned that this person would be going to the kennel to see Patches on the following day. My initial enthusiasm at hearing this news was dashed, however, when Joyce mentioned that the woman really wanted a female cat. The following day, I received an e-mail from Joyce. The note read: “Wonderful News. Patches now has a new home. Marcia went to the kennel today and fell in love with him. She brought him home where he will be loved beyond belief. Patches sleeps with Marcia and follows her around like a puppy dog”. After nine long and trying months of being confined in a cage, Patches was finally free, free to follow his heart, and free to be with his angel. After the news, I was introduced to Marcia and she invited me to see Patches in his new home. Seeing Patches no longer in a cage was nothing less than sheer joy. Looking back upon the day that I first visited the kennel, the reason why I was led down this path was no longer a mystery, as it became clear that what was meant to be was that the triumph of spirit over adversity would make Patches – One Lucky Cat! Ira Fischer is an attorney-at-law admitted to practice in the State of New York (now retired). Ira’s greatest passion is animal welfare and his full Bio can be seen on his website [www.irafischer.com], see Ira Fischer’s Biography. The website’s theme is Kindness and Compassion for Animals, and it contains informative material for those interested in animal welfare. Patches One Lucky Cat by Ira Fischer can be viewed on the website of Happy Herald. Another version of Patches’ story, One Lucky Cat: How Home for Life Animal Sanctuary Saved Patches, can be viewed on the website of Home For Life Animal Sanctuary. Patches speaks for all these animals with his wish: “Please, save me, so I can live the rest of my life as a happy cat with someone to love.” If people would open their hearts and give these animals a loving home, not only would there be dramatic drop in these horrific statistics, but also the caregivers would be rewarded with the unconditional love that is the trademark of a beloved pet. Charitable giving to your favorite organization is another way to help alleviate the misery of pet homelessness. For dos and don’ts of charitable giving to organizations dedicated to providing shelter to homeless pets, see Ira Fischer’s Guide to Charitable Giving for Animal Welfare Organizations. 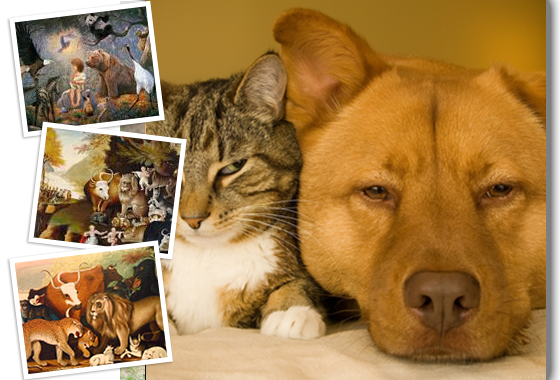 For resources concerning the issue of homeless pets, as well as interesting and informative books and films about companion animals, visit Ira Fischer’s Library of Books and Films About Animals.